Project Server 2010 - One or multiple PWA instances? In our Project Server 2010 practice we work with various customers and see their deployment strategies, problems and great things. Today, I wanted to cover one of the major issues that big companies without centralized PMO are facing. The problem (challenge) is - Should organizations create one PWA for entire organization or several PWA per business unit or department? Our recommendation is ONE PWA. One of our customers had 2 departments that started implementing project server about the same time but independently. Now - the challenge is to merge the data. 150 projects total, project sites, duplicated custom fields and names, different document library structure. It is a significant effort that is way more complex now than to have several joint meetings to discuss the approach, attributes and structure. If fact, this was driven by requirements to isolate data between departments and this is a task for Project Server 2010 consultant / consulting company or qualified Project Server 2010 Administrator to configure security in a way that it will isolate data. Executives can see all the information in one place. Ability to do the cross-departmental dependencies in projects. I would recommend using additional PWA for test / staging environments if there is no additional hardware available (recommendation is still to have staging / development environments as separate farms). Feel free to comment or ask questions - I will be happy to answer. FluentPro released PowerShell snap-in for FluentPS library that allows you to manage and perform actions with most of the objects in Project Server 2010 with the Powershell. Project, Tasks, Resources, Workflows, Security - just write code in PowerShell and you can automate project server activities. From time to time we are facing customers who cannot print SSRS reports on their PCs from SharePoint or Project Server. Solution: Install the RSClientPrint.cab file. Discovered some gaps in my knowledge (migration from 2003 and 2007). Some questions are stupid, made not for knowledge, but for reading the questions. Right now I am working on merging of 2 instances of Project Server 2010 into single one. one is using Single Entry, second one is using Free Form for progress reporting and no time sheets. Beside custom fields, the biggest challenge is that both instances have over 50 projects that are actively being used and so far it looks that this will be the most time consuming operation. Proposed strategy is to pick one instance that is more "clean" and less "messy" and have it as "master" instance and merge another instance into this one. Pick one instance as master (I1). The easiest workaround for moving projects between instances is to save all task level custom fields into standard local column (Text1..., Number1...) using Copy-Paste of columns, save a local copy, upload to destination server and copy values back to Enterprise custom fields. I will update this post if will find one missing steps. Update: We've developed a product - FluentBooks that allows configuration migration, merge and documenting. You can learn more here or watch a sample video in another our blogpost. Today was on a call with company that had implementation of PS by quite big EPM partner. This was ugly. To display milestones on Project workspace they put schedule control. On Status Report page instead of displaying information they have a mix - data entry and some display. To create a page to display risks and issues from all projects they read from number of sites but display just name. In custom fields there are like 30 extra fields that never were used - looks left from 3rd party solution. It was really bad; Partner simply stepped out after a while not completing solution but getting paid. Nice. After being involved in Project Server 2010 Solution Starters development, we are always pleased to see that companies who are implementing / using Project Server 2010 utilize some of the solution starters. From our experience, most popular ones are Dynamic Workflow, Bulk Edit and Bulk Import. Here I wanted to share some ideas / problems from customers who are using them. using custom fields with lookup tables and populating values. Maybe community should ask MS to implement some of those changes? In this post I will cover how we can create a support of Programs and Portfolio Functionality in Project Server 2010. By definition, project is "a temporary endeavor undertaken to create a unique product, service or result". Program can consist one or more Projects that are delivering within one initiative; Portfolio can consist one or more Programs or Projects and is more strategic grouping. Usually, Program can have its own schedule ignoring the fact that it can contain more than one project which can define the duration, start / end dates; Logic behind giving ability to have own schedule is based on fact that there might be activities that has to be tracked on Program level. We can use the same logic for Portfolio, but in reality portfolio is a more a matter of "grouping" projects for reporting / structuring projects within organizational strategy. Program is defined as project with Program field empty and Is Program field checked; Program can have value in Portfolio field. Project has Is Program field unchecked; Project can have values in both Program and Portfolio fields. As significant improvement for managing lookup tables is to develop event handler on project save that will populate LT Program lookup table dynamically, otherwise you have to maintain it manually. Every report can incorporate links to drill down. After working on number of customer engagements and developing over 100 reports, we've decided to kick-off "assembly" of our own report pack. This report pack will include set of reports and set of custom fields that customers will have to add to the system in order to be able to use reports. Reports are based on SSRS. It covers Excel Services, SSRS, OLAP, Performance Point. We've started working on a check lists, guides and videos for configuring Excel Services, Analysis Services, Reporting Services for Project Server 2010 and plan to publish it for English and Russian content within next 30 days. Today, we've found strange error that disappeared after restarting IIS. We had a project level custom field (Flag) referencing task custom field as [Task Field Name]. For some very strange reason we were able to change value of Project Custom Field with formula in Project Pro (Server and PPro are with December CU). This was possible only in P Pro, not in PWA. After restarting IIS this behavior was gone; Very odd. I would like to highlight several items that we've learned after developing several complex workflows for our customers. Use event log for logging every steps in your workflow (helps to debug it); Log emails sent by workflow (who, when, where). More you log - more stable and tested your workflow is since debugging is not an easy one. 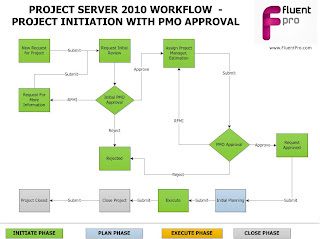 Our team is using FluentPS (http://www.projectserver2010blog.com) (we are developing and maintaining FluentPS) for workflow development and deployment, access to Project Server 2010 data, field info access / value modifications. Sounds like an advertisement - but FluentPS saves us a lot of time; you still can do everything with pure PSI. In current time, many organizations require process/project initiation process. In other words, every project that is created in organization has to meet not only business / financial requirements but also meet criterias defined by Project Management Office. This workflow defines a simple workflow that can be implemented in Project Server 2010. Compared to previous workflow, the only approver is PMO director, and persons is responsible for making sure that projects meet required standards and only approve ones that meet or reject / request a change for one's that do not meet it. This workflow also assumes change of ownership of project from Submitter to Project Director and then to Project Manager. In few next posts we will provide modification overview of current workflows for Portfolio Analysis integration. For some reason, workflow-enabled fields are not visible in MS Project Pro as well as multiline text. I can find logical explanation why MS did this; But - why not to go one step ahead and make them visible and read-only? Working on number of Project Server 2007 to 2010 upgrades, out team faced number of issues with clearing metadata, especially custom fields. We also met these issue few times doing customizations / audits of Project Server 2010 implementations. Typical problem is that some fields at customer's systems were using custom lookup tables with custom values - for example Yes, No, TDB (or different set of values); Then customer decides to move to Flag type for this field; or customer was using description field for capturing project summary but then decides to move to special field. It sounds quite easy - delete fields and create ones; But if you have over 1000 projects, that becomes quite complicated, since efforts to update / transfer those fields manually is quite big. Second option - go to DB (published) and do SQL update ( Strongly not recommended by Microsoft). 3rd option - create tool and do it via PSI. So, we've developed a tool that allows conditional transfer / conversion of fields using PSI. It is not fast (it takes about 5 to 300 seconds) for full cycle depending on project size / farm or single WFE / event handlers, but you usually run tool just once. 2. if Value =TBD, Non-Enterprise or Empty Set Value = 0. 3. Save and publish project. Tool is developed as WinForms application that allows to define number of such rules applied for the project. Tool iterates all projects (can specify Draft or Published only or all) and applies rules, saves and publish projects, so all data become visible. Tool is available for purchase. In February 2010, our team completed migration of Project Server 2007 system to Project Server 2010 platform with additional customization work. Original system contained over 1000 projects with about about 300 active projects in execution phase. As part of the migration, our client wanted to perform number of improvements in their current project initiation process, so we designed and implemented a workflow for that. On every change of ownership / action required system sends emails to all parties notifying of required actions. Most of the approvals have 3 states - approve, reject, request for more information. We've implemented detailed log trail for audit and maintenance using Event Log. 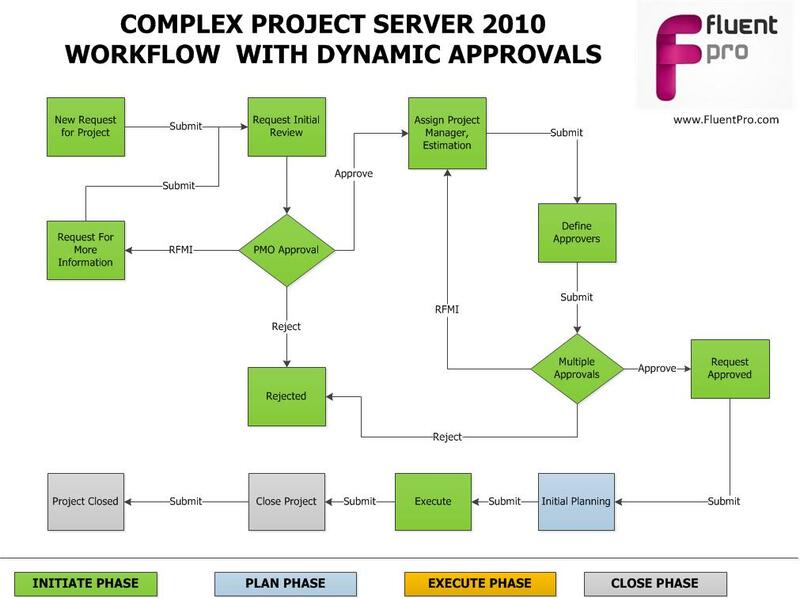 Dynamic project permissions management - since there are several owners during project life cycle plus number of additional key resources that need ability to access specific project only, we are dynamically give permissions for this project for specific users, this is done by workflow. Customer wanted Auto ID (user friendly of-course) generation - done with event handler and SharePoint list. There are number of project types (EPT), and depending on selected EPT, workflow routes project to specific manager in PMO. This is done with special routing table. Force check-in on ownership change: When workflow changes owner, it should do force check-in and publish, so another user can edit / provide information. 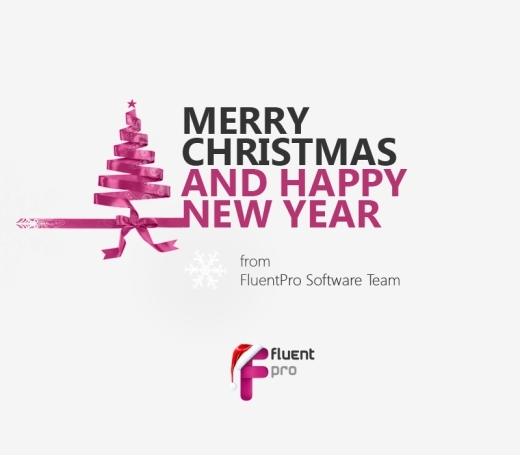 We are happy to announce release of FluentPS v.2.0 - open source library for Project Server 2010 development and customizations.